Mexican Migration Is Down—Now What? The Pew Hispanic Center made headlines yesterday with a report that confirms what the Center for American Progress has long argued: Heightened border enforcement, a worsening U.S. job market, and improved economic conditions and falling birth rates in Mexico are a recipe for a sharp drop in Mexican migration to the United States. The report illustrates just how behind the times “enforcement first” zealots are. They continually stymie any legislative reform of the immigration system until the border is fully secure. These views (as the Pew report shows) are not just a difference of opinion but also a serious distraction from the real problem facing U.S. immigration policy today—dealing with the 11.5 million undocumented immigrants who are already here. Arizona’s anti-immigration law, up for review by the Supreme Court tomorrow, demonstrates that state attempts to tackle this problem are ineffective as well as expensive. We need Congress to finally step up to the plate and enact comprehensive reform that would bring our immigrant population out of the shadows and would fully integrate them into American life. According to the Pew study, the number of Mexicans moving in and out of the United States is now about the same, with slightly more Mexicans leaving the country than entering it. The study attributes this decline in immigration to tightened border controls, weak job and housing construction markets in America, more deportations, and declining Mexican birthrates. This last point is particularly important. Lower Mexican birthrates mean that in the future there will be fewer people available to immigrate, likely making the current reduction permanent. A typical Mexican woman was expected to have more than seven children in 1960, but by 2009 that number dropped to just more than two. This will greatly decrease the number of young workers seeking to come to the United States. How should our immigration policy respond? Now for the big question: What does the drop in newcomers mean for U.S. immigration policy? First, it means that those who clamor for an ever-increasing program of border enforcement as a prerequisite to any comprehensive immigration reform are out of touch with reality. Charges that President Barack Obama is refusing to secure the border are blatantly false: Along with the drop in net migration has come a drop in apprehensions along the border as fewer people attempt to cross it. These “enforcement first” proponents are missing the bigger picture: Not only is our present level of enforcement working, but even with a precipitous drop in new migration, the United States is still left with 11.5 million undocumented immigrants already settled in the country that it must address. State attempts to deal with this problem aren’t working. Arizona’s extreme anti-immigration law S.B. 1070—and copycat laws in Georgia and Alabama—don’t drive immigrants out of the country. In fact, a recent Center for American Progress report found that most unauthorized immigrants choose to stay here despite attempts to drive them out. At best, anti-immigrant laws simply drive immigrants from one area to another rather than from the country. These immigrants decide to stay because close to two-thirds have lived in the country for 10 years or more. They have families and are part of their communities. Mexican migration is falling, but we’re still left with a large undocumented population. A patchwork of state laws similar to Arizona’s will only serve to divide the country between immigrant-friendly and immigrant-hostile states. So where does that leave us? 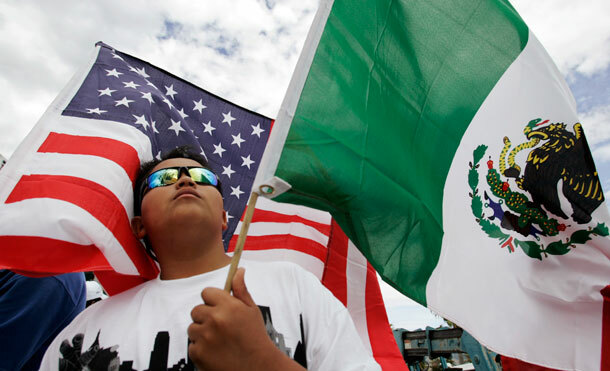 Integrating our undocumented population carries serious economic benefits. Bringing them into the legal workforce through a tough but fair process of earned legalization would add a cumulative $1.5 trillion to our nation’s gross domestic product over the next 10 years. That’s nothing to scoff at, as our country still struggles to put the Great Recession of 2007 to 2009 well and truly behind us. Comprehensive immigration reform would support the creation of a significant number of jobs for Americans and generally raise the wages of allworkers, both native and newcomer. The bottom line to yesterday’s Pew report is that as fewer people seek to enter the country from Mexico, we must turn to the immigrants already here. Doing so makes fiscal sense, and it follows our tradition of being a nation that welcomes immigrants and the benefits they bring onto our soil. Dan Wagener is Senior Managing Editor for Online Communications at the Center for American Progress who focuses on immigration issues.